I am excited and honoured to announce that I am one of Ceramic Monthly’s 2017 Emerging Artists! I have subscribed to the magazine since I was 16 years old, so it is a thrill to be featured in the magazine. I am amongst such great company too! 19 other artists received the award, including my classmate at LSU, Mike Stumbras. It is an exciting time for me—my thesis exhibition opens in a little over a week, and I will be wrapping up my time in Baton Rouge shortly after. It is now over four years ago that I took a big leap of faith, quit my day job, and flung myself back into a life in clay. It hasn’t always been easy, and there have been many times along the way that I have questioned wether it has been worth it. Now isn’t one of those times! I went to grad school because I wanted to make better work, and because I wanted to find my voice as an artist. Three years later, and I feel proud of the work I make, and excited to share it with the world. Thank you to all who have supported me in this journey (specifically my parents). I couldn’t have done it without their love and support. Originally published in May 2017 issue of Ceramics Monthly, page 60. http://www.ceramicsmonthly.org . Copyright, The American Ceramic Society. Reprinted with permission. 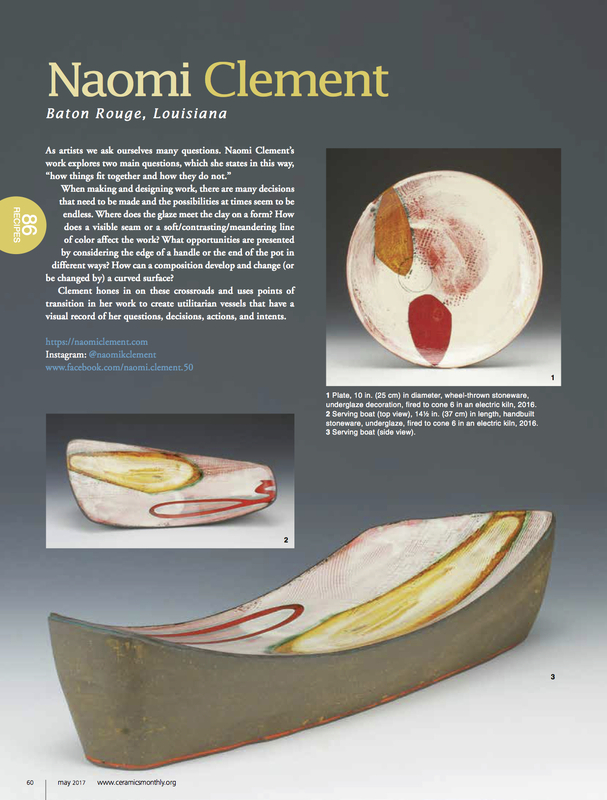 This entry was posted in News, Uncategorized and tagged canadian ceramics, ceramics, ceramics monthly, emerging artist, LSU ceramics, naomi clement by naomiclementpotter. Bookmark the permalink.